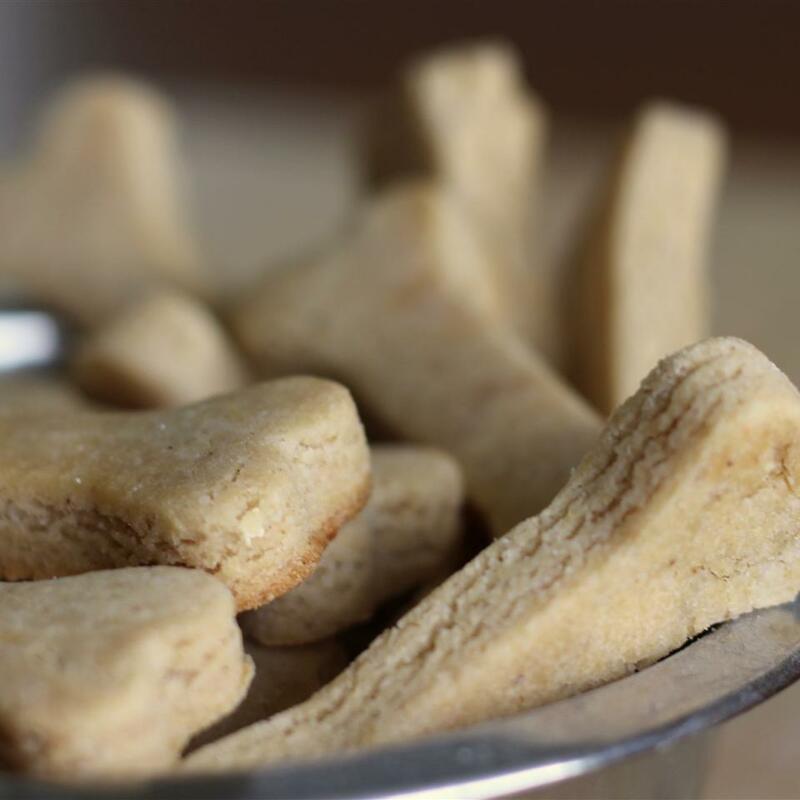 Some delicious, easy to make dog treats that use simple ingredients! This was a great recipe as the dough was extremely pliable and didn&apos;t crack a bit. 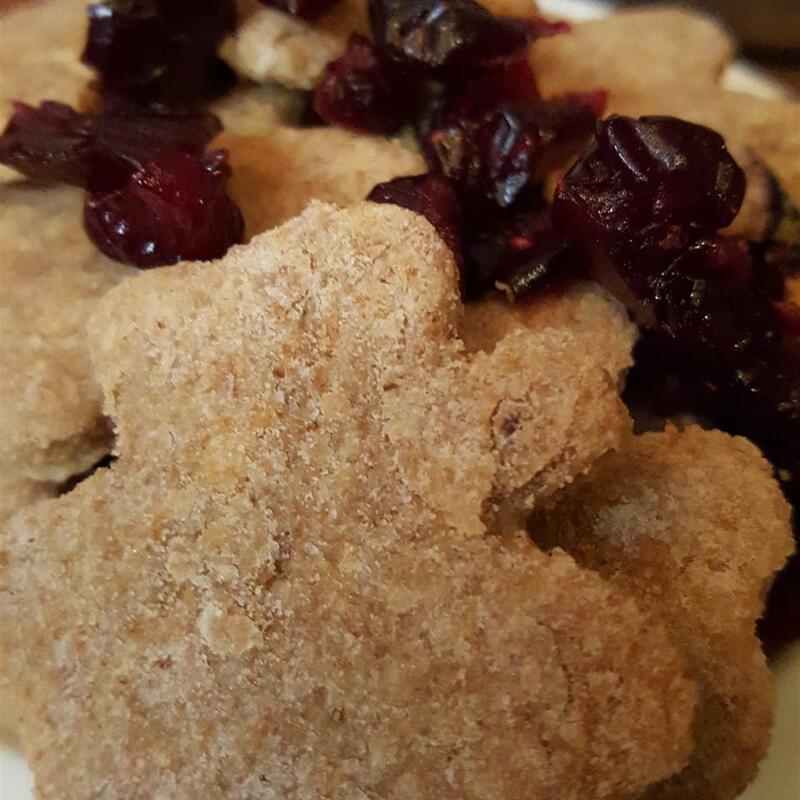 The smell throughout the house had me making sage biscuits to go with the people dinner. My daughter had a lot of fun playing with the dough while the first batch was baking. The dogs loved it too. Hint: What to do with leftover bacon grease? Use it in place of the butter! Store the grease in the fridge until it&apos;s ready to use & follow recipe as with butter. 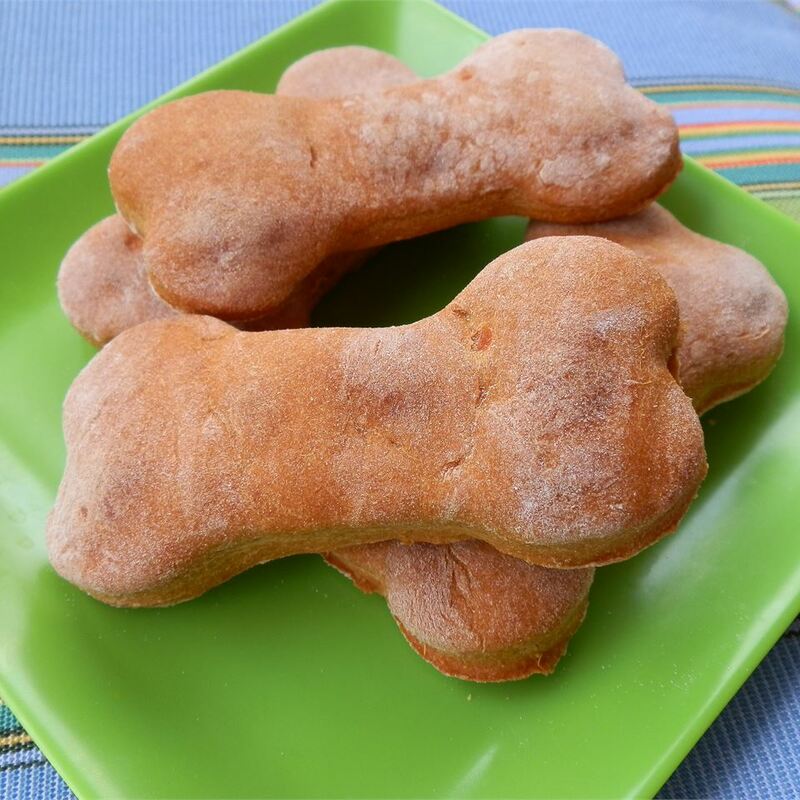 I made these treats today and my dogs loved them. 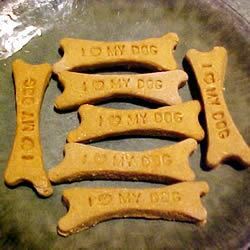 I am making these for Christmas gifts for the family dog! 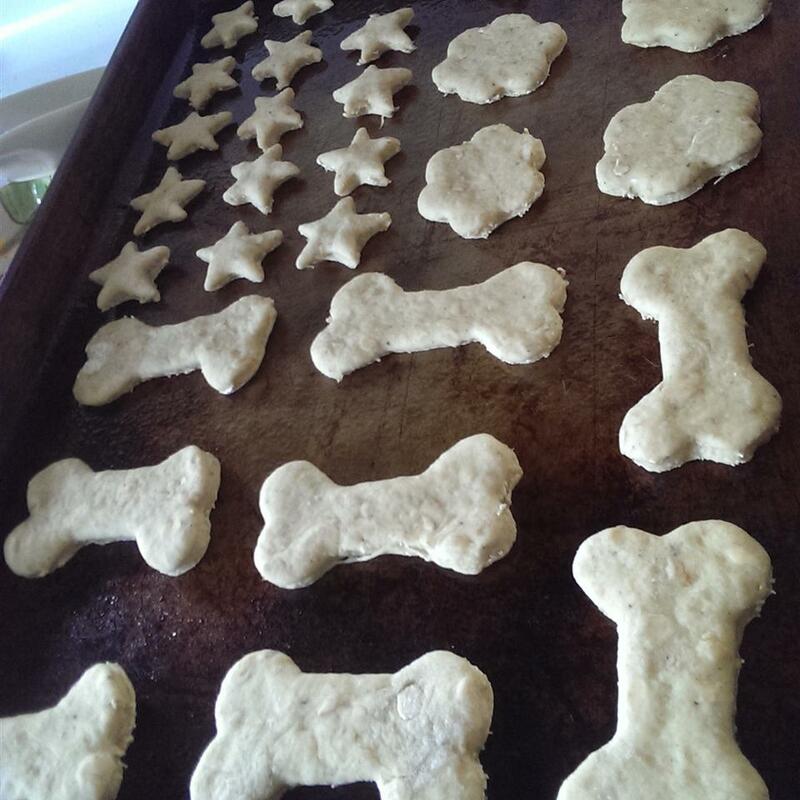 I made a trial batch for my own 3 dogs and they all went cazy for them! I work as a vet tech and of all the recipies I found the ingredients in this one to be the best. I did make a few changes of my own I exchanged the milk (dairy products often cause digestive upset) for more water and added 1/2 cup of parsley (it helps with dog breath). 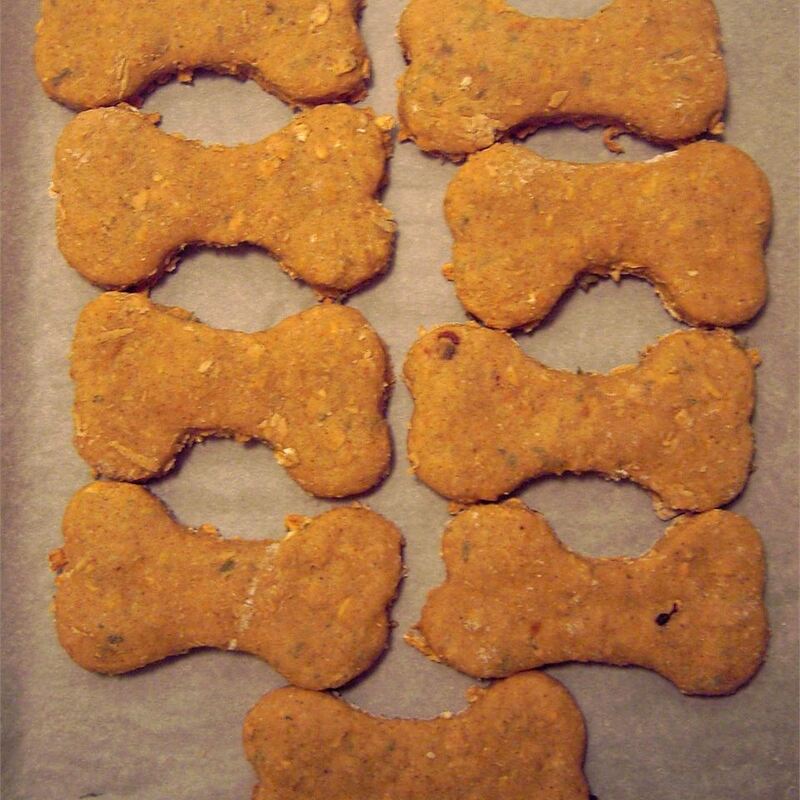 the parsley gave the treats a festive look without using food coloring that many dogs can be allergic to. 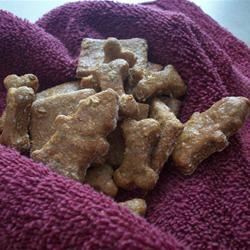 I changed this recipe a little becuase I know that sugar isn&apos;t good for dogs and they don&apos;t really care for it either. Instead I used peanut butter (about 1/2 cup). I used 4 beef and 4 chicken bouillon cubes in 2 cups of boiling water instead of milk. I used parsley (about 1/4 cup) instead of paprika (I read a review where someone said parsley helps with dog&apos;s breath). I didn&apos;t use any poultry seasonings butter or milk. Again I don&apos;t think it&apos;s needed in a dog treat. Next time I think I will put more eggs and add garlic. 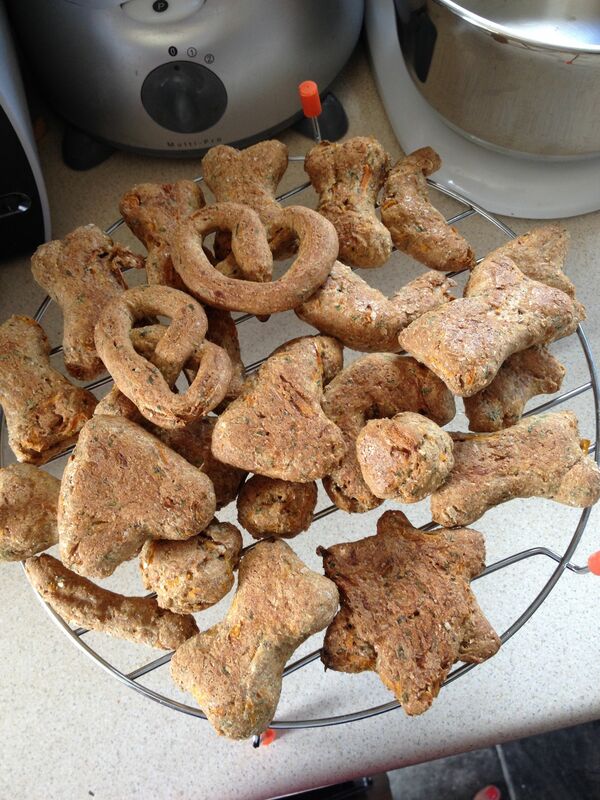 But with the changes I made the first time my dogs loved them! And they actually picked them over store bought!! That&apos;s a success in my book! 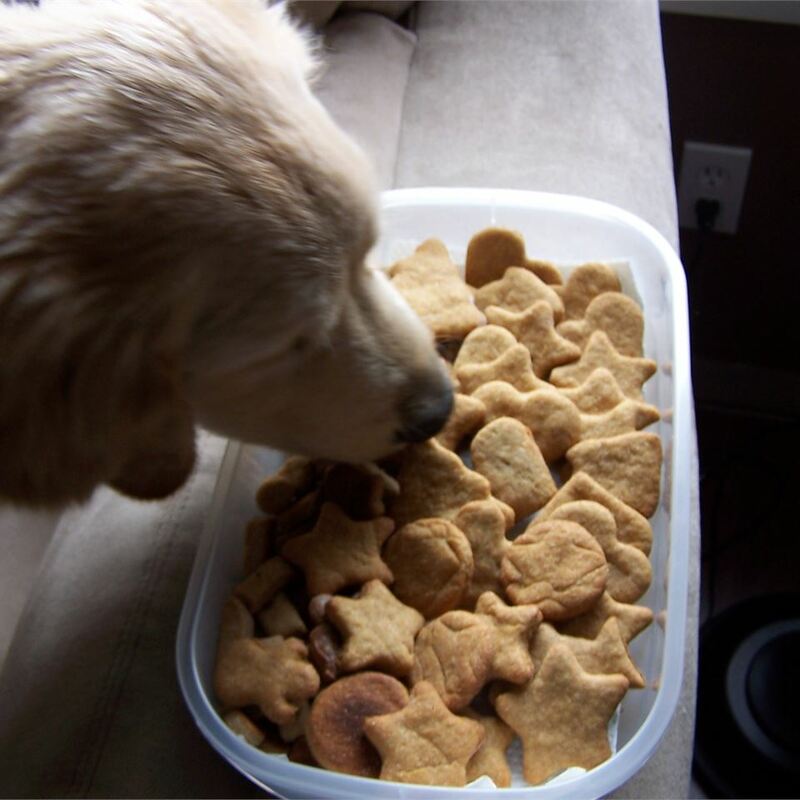 Toby thinks these are yummy! He&apos;s a lab...don&apos;t they like everything? 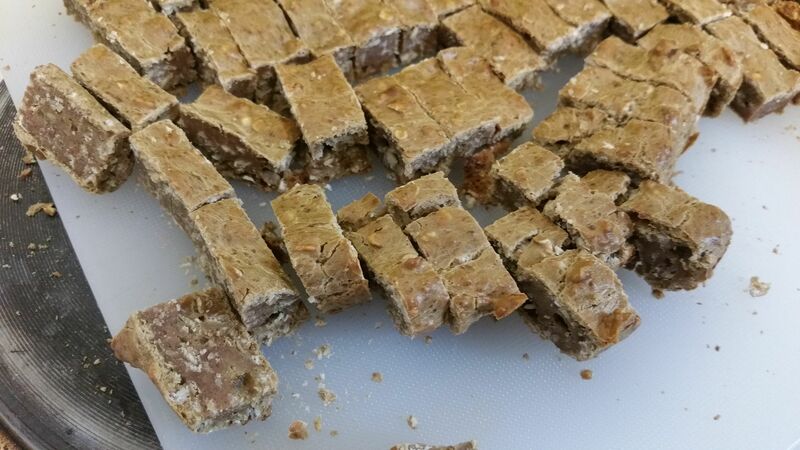 We used half wheat flour half white and about 6 tablespoons extra to give it the right consistency. My puppies love them and can&apos;t get enough of them. 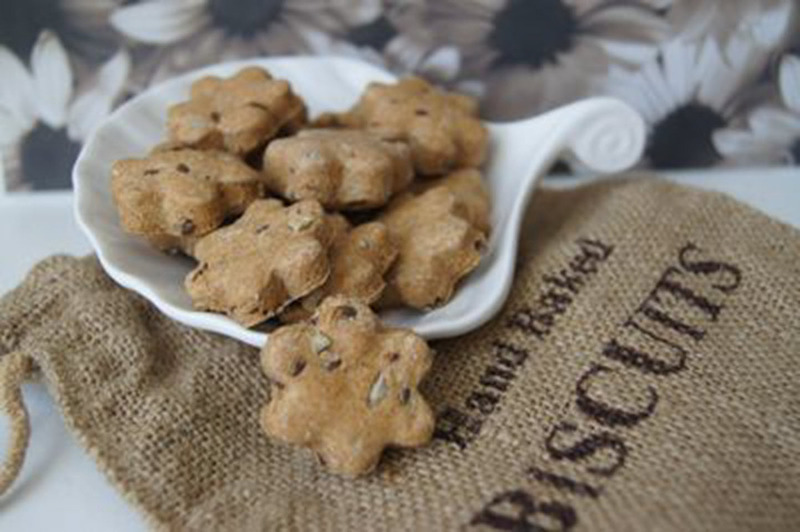 I made them as Christmas gifts for friends&apos; dogs this year and everyone was telling me how much their dogs loved the cookies. 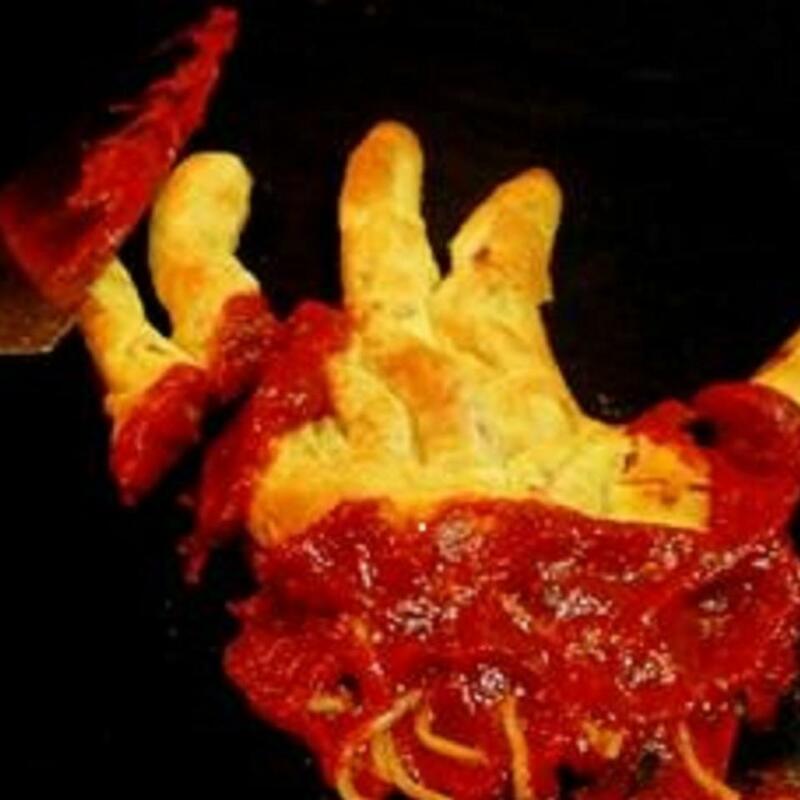 Several people have asked for the recipe. 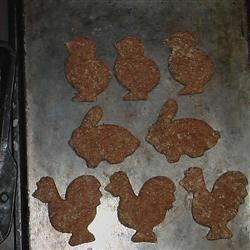 I will say though with the small bone shaped cookie cutter I have the recipe makes WAY more than 54 cookies! I have also subsituted chicken broth for water and when I did that I could barely manage to bake them because I was tripping over both of my dogs and my father in law&apos;s dog as well! 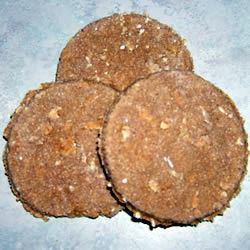 Omit the sugar substitute wheat germ. 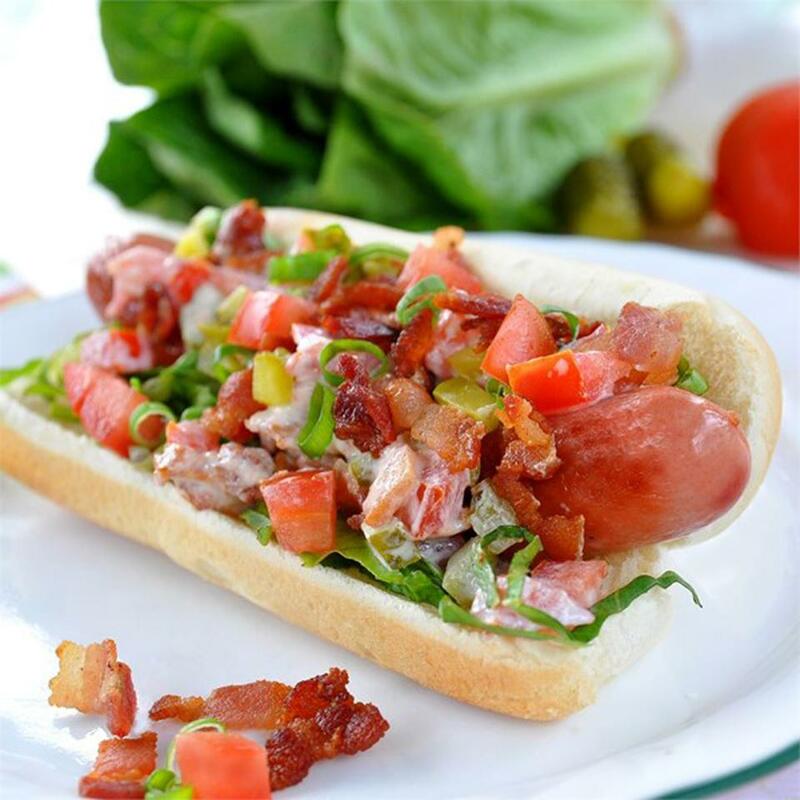 Healthier -- doggies won&apos;t miss it. It&apos;s owners who like sugar. We skip the fancy shapes too and roll our treats into little balls. They keep very well in the freezer. "Bob" gets one a day and the vet says she rarely sees an 11 year old dog in as good a shape! 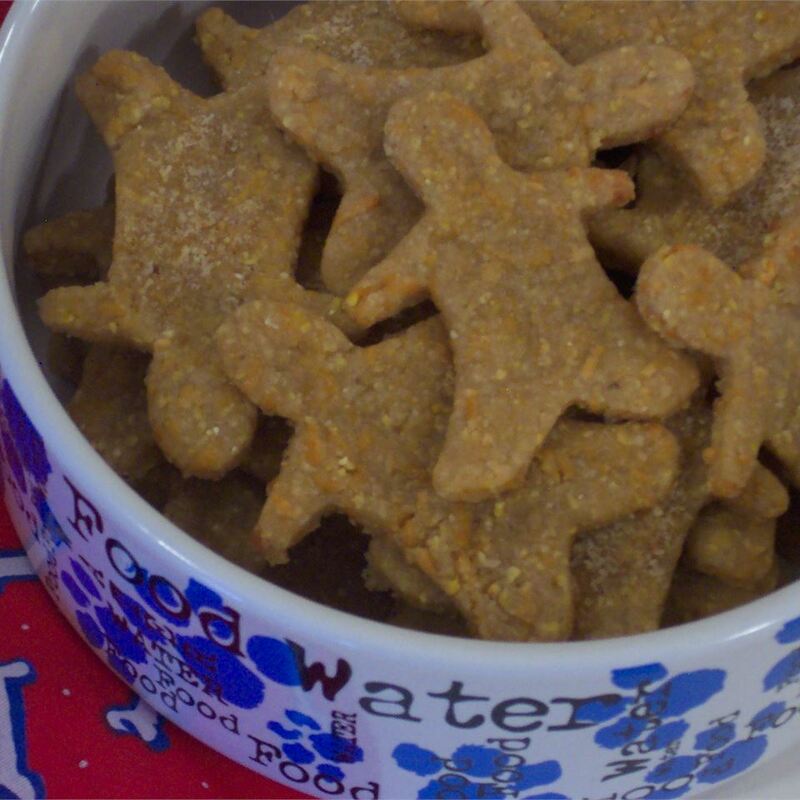 Great dog treat recipe. Easy to work with. I posted a photo but it hasn&apos;t been approved yet. I cut the treats with Christmas cookie cutters. I think next ime I&apos;ll make them a little thicker and just bake them a little longer. I baked these 30 minutes. That was the perfect time. They are a gift for a friend&apos;s dogs. They&apos;re cute lil&apos; treats. 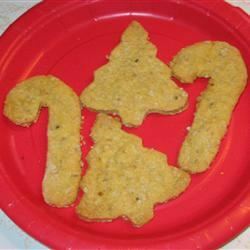 Thanks for posting the recipe and Merry Christmas! My shi-tsu loved them but my other tewo didnt like them. I even put peanut butter on them and someothers I tried bacon grease and they still wouldn&apos;t touch them.